Hibs head coach Paul Heckingbottom has been named the Ladbrokes Scottish Premiership Manager of the Month for March. The former Barnsley boss enjoyed an unbeaten month in the league with his new side, recording victories over Motherwell and Livingston and drawing with Rangers as the Easter Road side strengthened their top-six hopes. Heckingbottom has only suffered one defeat since taking the reins at the Capital club - a 2-0 defeat at home to Celtic in the William Hill Scottish Cup quarter-finals - and has five wins and two draws in the league after last night’s stalemate against Kilmarnock at Easter Road. It is the ex-Leeds manager’s first monthly award in his four years as a football manager. 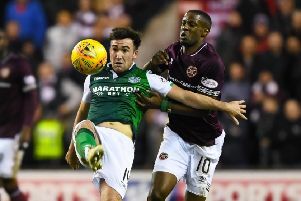 Hibs’ last success in the monthly award came in October 2017, when former Easter Road head coach Neil Lennon picked up the prize after wins over Hearts at Easter Road, and victories at Motherwell and Kilmarnock. The Northern Irishman also won the Ladbrokes Championship Manager of the Month gong on two occasions; in August 2016 and January 2017. His predecessor Alan Stubbs won the second-tier prize four times, in September 2014, February, October and November 2015.